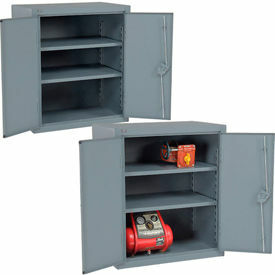 All-Welded Heavy Duty 12-Gauge Cabinets Withstand Extremely Heavy Loads for Industrial Grade Storage Needs. 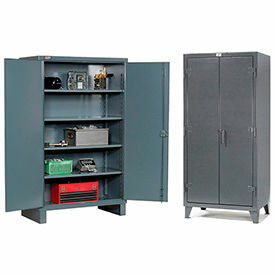 All-Welded Heavy Duty Storage Cabinets provide superior strength with durable 12-gauge steel for maximum protection of contents. Cabinets feature a 3-point latching system, padlockable hasp, or a keyed lock for security. Available types are Double Shift and Storage. Solid Front cabinets have single or dual doors that swing open 180°. 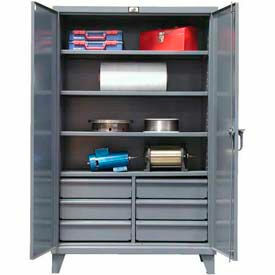 Double Shift cabinets provide two separate storage compartments. Shelves adjust at varying increments. Shipped fully assembled and ready to use. 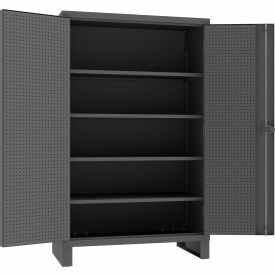 Shelf capacities range between 950 and 2000 lbs. 3, 4, 6, and 8 adjustable shelves available. Dimensions vary per model.